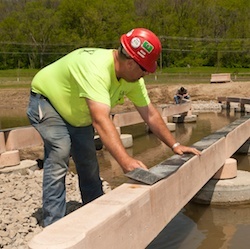 You may be familiar with the terms concrete pier, concrete caisson or concrete pile. 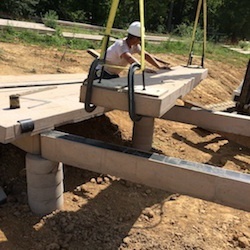 While these terms are often used interchangeably, technically, a concrete caisson is one type of a concrete pier; these are typically formed in place. 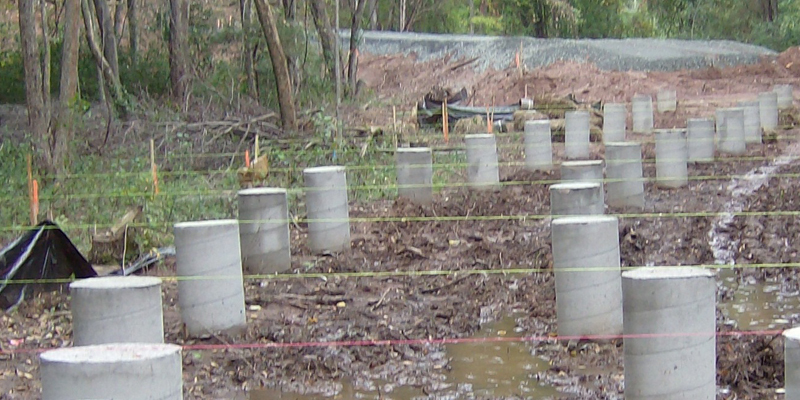 Precast concrete piles are typically driven or vibrated in to place. 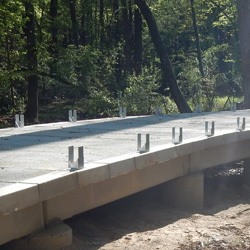 Concrete offers durability and longevity for boardwalk construction over lakes or streams, through wetlands or floodplains. 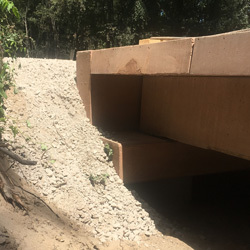 If the geotechnical report calls for a deep concrete pier, these can be constructed as an augered hole or drilled shafts with a casing used to pour the cast-in-place deep footing. 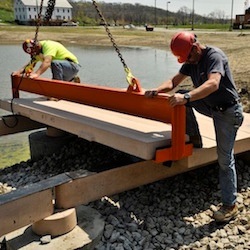 Read on to learn more about our typical recommended installation process when constructing a PermaTrak boardwalk on concrete piers or piles. 1. The PermaTrak system is manufactured by pre-qualified regional precasters throughout the country. We own and maintain these steel production forms to ensure consistent quality control. 2. 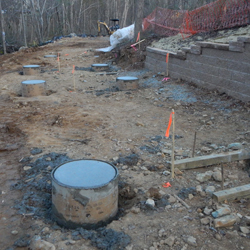 Sonotube casings can serve as temporary forms as cast-in-place reinforced concrete piers are constructed. 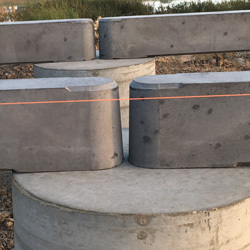 Concrete piles may also be precast, shipped to the site, and driven into place. 3. 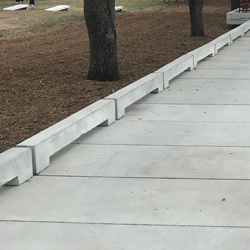 The boardwalk's beginning and ending stations typically utilize our precast abutment piece, on an unreinforced concrete leveling pad. Lift inserts allow for easy handling. 4. Once levelness and position of the concrete pier has been verified, PermaTrak's beam can be set. Typically a 1/2" gap is left between ends. Shim and grout may be required under the beam to ensure proper slope. 5. Beams may require a mechanical connection to the pier, depending on specific project requirements. 6. A 1/8'' rubber bearing pad strip is laid on the beams to eliminate any potential uneven bearing. 7. Curved alignments are easily accommodated by adjusting the beam lengths of the inside and outside runs. 8. 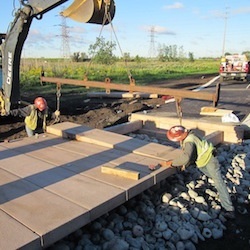 Precast treads are easily maneuvered into place with small construction equipment. 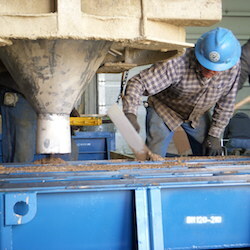 Spud bars or crow bars used from underneath the boardwalk allow installers to adjust the treads' final position on the precast beams without damaging the finished walking surface. 9.Tread installation continues by aligning PermaTrak’s interlocking keyway system and maintaining 1/8”-3/8” joint spacing between treads. 10. 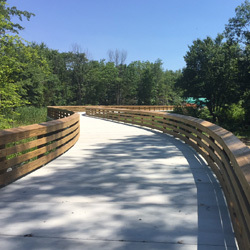 Curved alignments are formed by use of tapered boardwalk tread components. See our Engineering Layouts page for more information on horizontal alignment and minimum radii. 11. 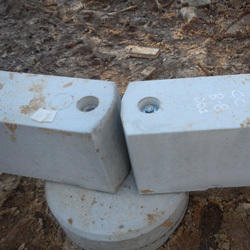 Precast concrete curbs (supplied by PermaTrak) are also popular choices as an add-on feature. Connecting hardware is hidden from view and curbs attach without any field drilling. 12. PermaTrak's steel brackets are manufactured with a galvanized steel finish. A 4'' x 4'' timber post fits into the bracket to allow for a variety of timber railing designs. Bolts connect to a bottom plate on the underside of the walking surface. 13. Railing options with the PermaTrak boardwalk system span a wide range. 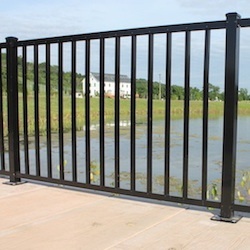 See Railings for pricing and design information. 14. 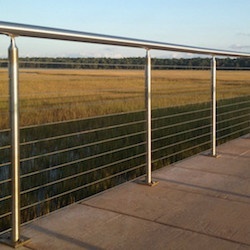 Aluminum railings can also be supplied as a cost-efficient boardwalk railing. See "What Types of Railings Does PermaTrak Offer?" for more information.